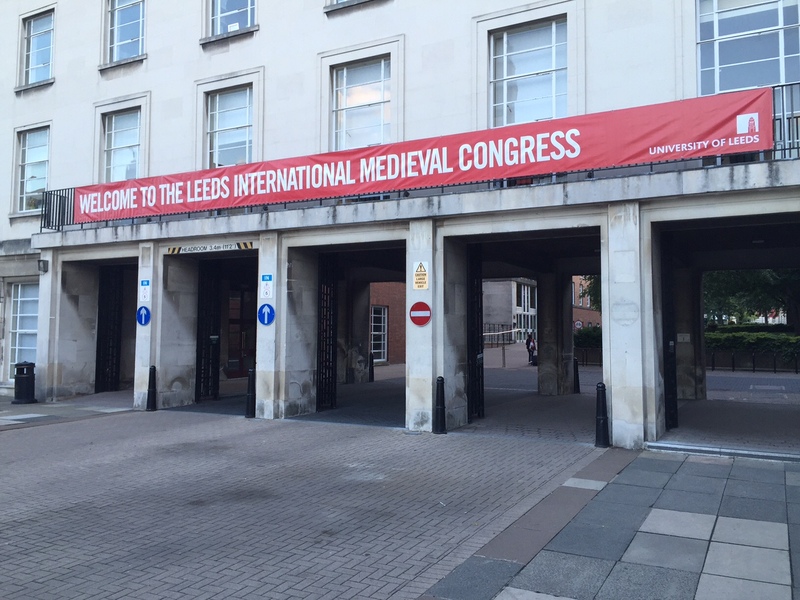 An email from the IMC organisers was sent out a couple of days ago, in which it was mentioned a ‘record-breaking 2400 medievalists from 46 countries made it to the Congress’ this year. I can well believe it, the campus was heaving with people, bringing back memories of term-times when I was a Leeds student. Such numbers make it the second biggest medieval conference in the world, after Kalamazoo (I’m intrigued to know what takes bronze medal in the rankings – any idea?). 17 sets of sessions, plus keynotes, round-tables, receptions and more, across four days (and this is just the core of the programme!) make it a pretty gruelling event. The two days of holiday I took post-Leeds was a great idea it turns out. 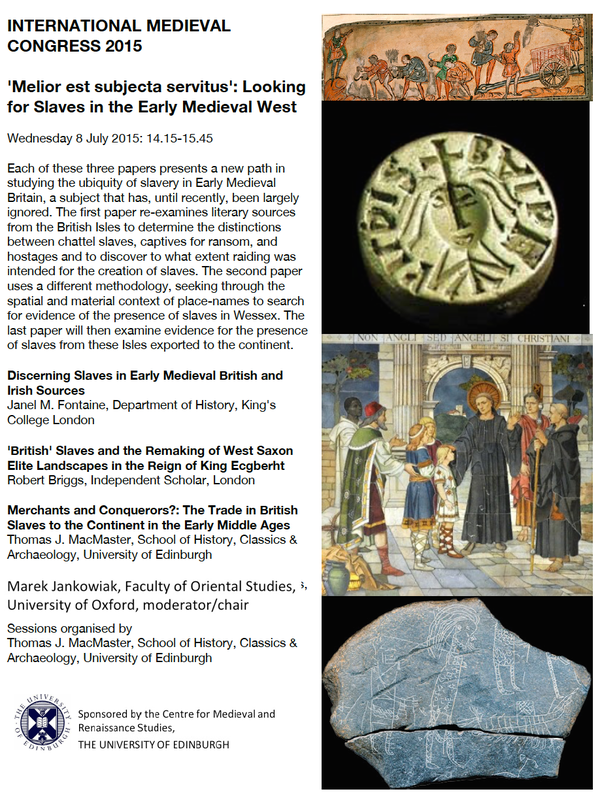 As trailed in my previous post, I gave a paper on the Wednesday afternoon – so just over halfway through the Congress – in Session 1202, ‘”Melior est subjecta servitus”: Looking for Slaves in the Early Medieval West’. Organised by Tom MacMaster, moderated by Marek Jankowiak, and kicked off with a brilliant paper by Janel Fontaine, everyone present agreed the session was a resounding success. 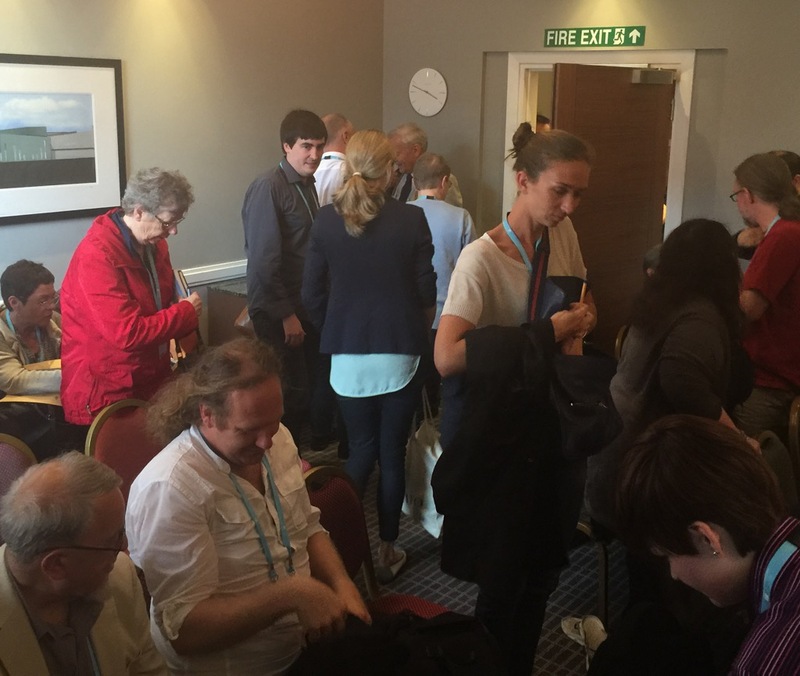 I say everyone present, as the session room was so rammed to the gunnels with people that many who wanted to attend could not, or else were forced to stand with one foot in the corridor and no view of the speakers or screen. I salute those people for whom the latter applied for sticking around – I can’t say I would have had patience to linger when faced with the same limitations. 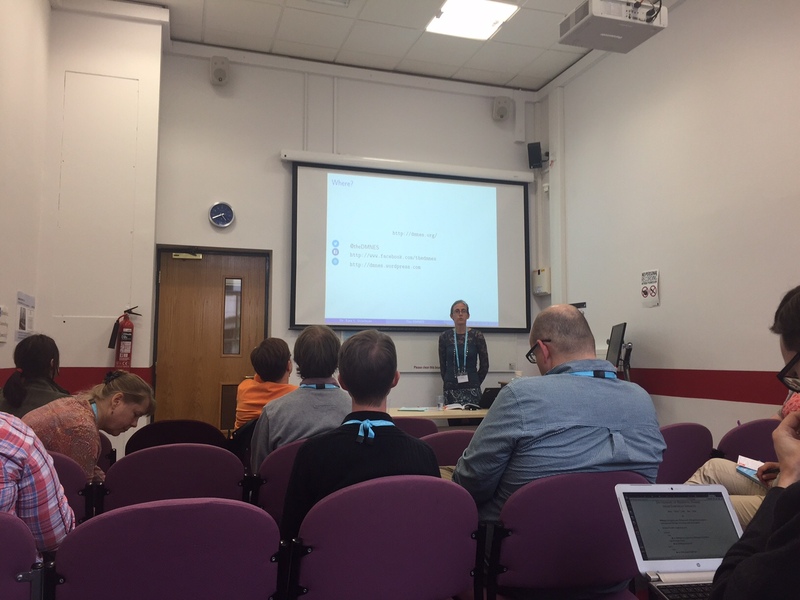 Yours truly a couple of minutes into giving my paper (photo c/o Emma Vosper @EmmaVosper). Grace Jones featured on the title slide and later on in the presentation as part of a Slave to the Rhythm-related “joke” which probably didn’t make sense to most of those present, and is certainly not worth repeating here! It’s hard to legislate for the likely size of audience months in advance – not least when a session clashes with others concerning the same time period and/or geographical region – but it was a shame not everyone could stay for the papers and participate in the discussion at the end. 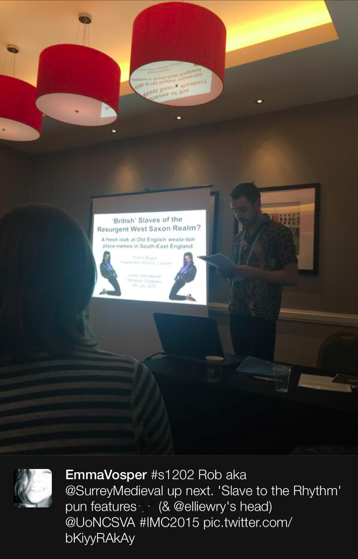 The latter achieved just what I wanted it to do in respect of my own paper (a summary of which you can read over on my Academia profile), which was inter-disciplinary but fundamentally concerned with place-name evidence rather than historical or literary records of slavery. In reviewing past approaches to my topic, it’s clear previous scholars have focused on determining the meaning of the elements of the relevant place-names but given scant regard to the nature of the settlements to which they were attached and how these came into being, something I’m keen to overcome. My preference for a primarily slave-based interpretation of the settlements and names needs to grapple much more with how they would have operated – one thing I took from the session is quite how hard it is for us as Western medievalists to comprehend slavery as an everyday socio-economic institution. I was particularly stoked to meet Leeds’ own Katherine Miller after the session. She completed a fantastic Ph.D thesis on Old English words for slaves last year, which I used and acknowledged a debt to in my paper. It proved very popular when I tweeted a link to it a couple of months ago, so if you didn’t take a look at it then I really do recommend you read/download this excellent piece of scholarship at White Rose eTheses Online. My sense is that a lot of IMC attendees are there to give papers or else act as session moderators, respondents etc., but by no means everyone does so. 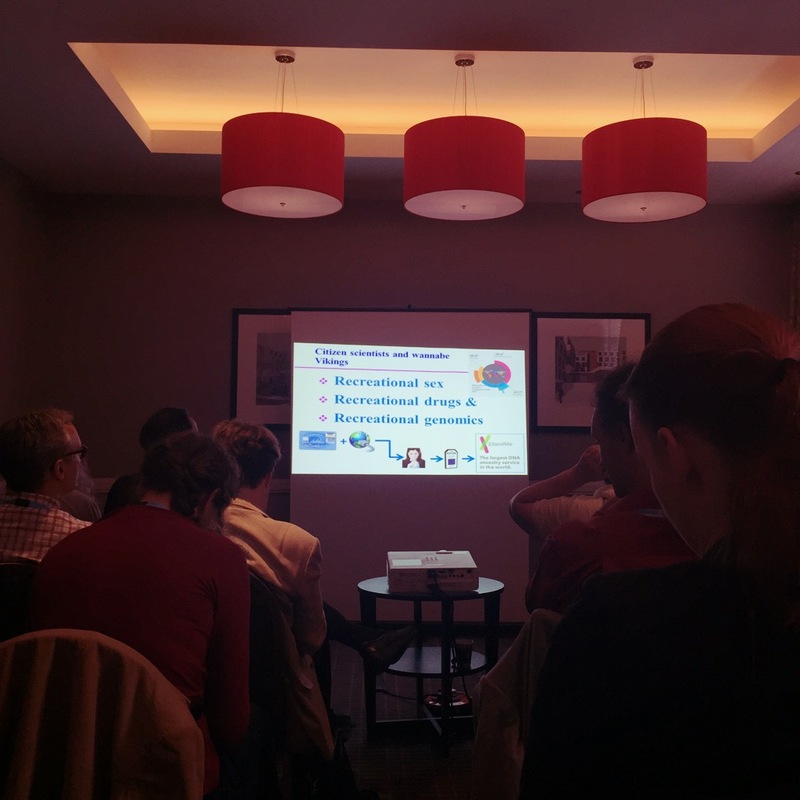 Two things uniting everyone present are the opportunities for hearing about all manner of fresh research and for networking with fellow researchers in your chosen field. 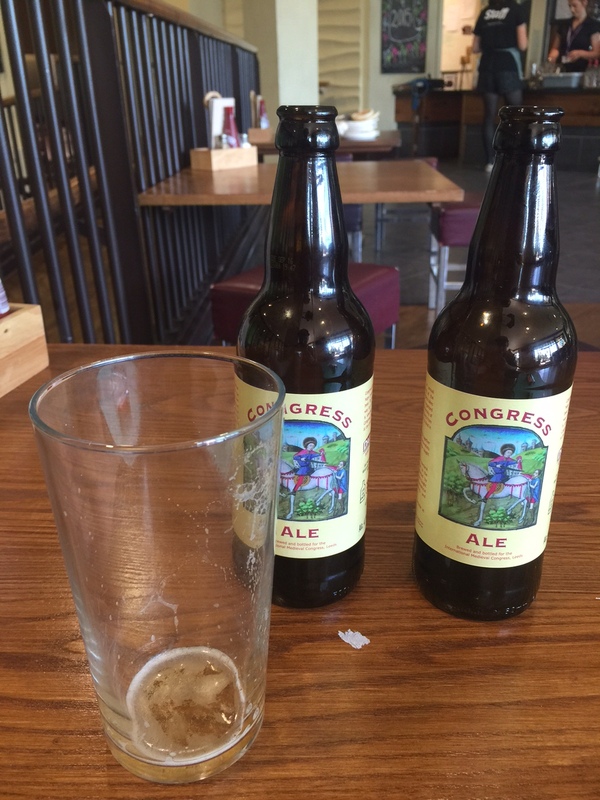 On the first count, the 2015 Congress more or less lived up to my expectations: plenty of interesting new information to take away and digest, but nothing truly revelatory, though the round table on Space and Place held on the Monday evening was incredibly stimulating (particularly for someone like myself with a keen interest in place-names, who has often pondered why there has been no meaningful discussion of the concept of space-names). Every IMC has an overarching theme, which influences the content of the sessions and papers to varying extents (down to none whatsoever). This year’s was Reform and Renewal, two overlapping concepts which I think my paper could be said to have addressed at different points, even though I neither pitched the proposal nor wrote the paper with them in mind! Beyond this, I picked up on a number of “unofficial” themes and trends which surfaced at various points over the course of the Congress and I thought would be worth highlighting here, especially for readers who were present at Leeds to compare with their own take-away impressions of what felt important/current. (1) To start by indulging in a spot of medievalist trend-forecasting, I predict you’ll be hearing a lot more about “trans-disciplinary” research, and frankly anything where “trans-” can supplant “inter-” or “multi-” as the prefix which best connotes complexity/dynamism/innovativeness. One particularly successful deployment of it was in the context of Catalin Taranu’s exploration of the “trans-ethnic” assertions of Gothic ancestries among peoples of who are considered to be “Germanic” (a problematic though not necessarily erroneous label culturally) in northern Europe from the ninth century. Place your bets on how many years it will be before the IMC theme is “Trans-disciplinarity” (presumably not before spell checkers accept it as a valid word!). (2) Another theme that bubbled up repeatedly in the sessions I attended was ethnicity/ethnic identity: how it can be perceived looking back in time from today, and how it was perceived at the time in whatever part of the medieval period was under discussion. It’s probably no accident that certain trends current in politics the world over make this something of a hot topic. The overwhelming message coming from those who gave papers addressing the matter was that it’s hard to discern if ethnic identity was really a thing back in the day. So I heard James Harland, in an excellent and (for its early morning slot) uncompromisingly rigorous review of approaches to the burial record of fifth-century lowland Britain, cited a range of authors who have offered different opinions on the matter, including deconstructivist approaches which deny the very existence of historically-attested “ethnic” groups. Broadly the same subject was covered from a very different angle in the final session I attended (subtitled ‘Methods to Reconstruct Migration – History, Archaeology and Genetics’), where the presenters appraised the contribution of genetics and other forms of bioscientific research. Again, I took from these contributions the inherent difficulties of isolating genuine evidence for ethnicity from genetic or artefactual assemblages, certainly now we are beyond the days of racially-driven research to serve nationalistic political purposes. I was also very taken with a closing remark (from Prof. Mark Jobling, I think) saying that there is an almost innate desire in humans, not just historically but still today, to have an ‘origin story’ with which to situate themselves in both past and present. The philosophical and scientific discourses brought to bear on issues of ethnic identity are ones I hope to become more familiar with as I proceed with my Ph.D research. Given my particular subject matter, I was very pleased to hear that group identity is not only more straightforward to discern and but equally seems to have been an important means of constructing identity in early medieval societies. When it comes to my own research, I’m particularly keen at the outset to define my terms on a social anthropological level; it will be interesting to see where (if at all) ethnicity features within this context. Those interested in matters of ethnic identity in the early medieval period may like to stash in the back of their minds notice of a conference that’ll be happening at the University of York next Spring. Details are scant but from what little I know about the event it sounds like it should be a corker. (3) Perhaps the most important theme in this time of impact and relevance was the power of social media, especially Twitter, as a means of engagement with fellow medievalists as well as interested non-specialist audiences. Someone crunched the numbers at some point during the Congress and worked out this year’s IMC was the most tweeted about medieval conference ever on the basis of the hashtag #IMC2015 (I make it that I was responsible for 25 uses of it), and a lot of people got all excited when the hashtag for Session 1403 (‘The Twitterati’ – who thinks up these names?) started trending at a national level. Which are all well and good, but how can this all be harnessed so that it’s not just an inward-looking, potentially off-putting conversation between tweeting academics? And, in terms of aforementioned academics, how can the ideas being bounced about be taken out of Twitter and applied in more substantial, practical research collaborations? Maybe if I’d been in attendance at the relevant sessions I would have some answers to these questions for you! Day 1 saw the official launch of the Dictionary of Medieval Names in European Sources (dmnes.org). I got just the answer I was looking for when I tweeted the DMNES the week before while writing my paper, only to forget to so much as mention it on the big day! Fortunately, I was able to help out by letting this photo of mine be used as part of the write-up of the launch on the DMNES blog. So there you have it – Twitter breeds useful collaborations, but cannot always jog the mind of a forgetful but truly grateful speaker! Not that it’s the maximum 140 characters per tweet which is the only limitation to opening up new avenues. I spoke to one session organiser who felt there was a frustrating reticence on the part of people whose papers intersected, and in doing so pointed to important areas of future investigation, to acknowledge such opportunities and talk about ways of undertaking collaborative research. 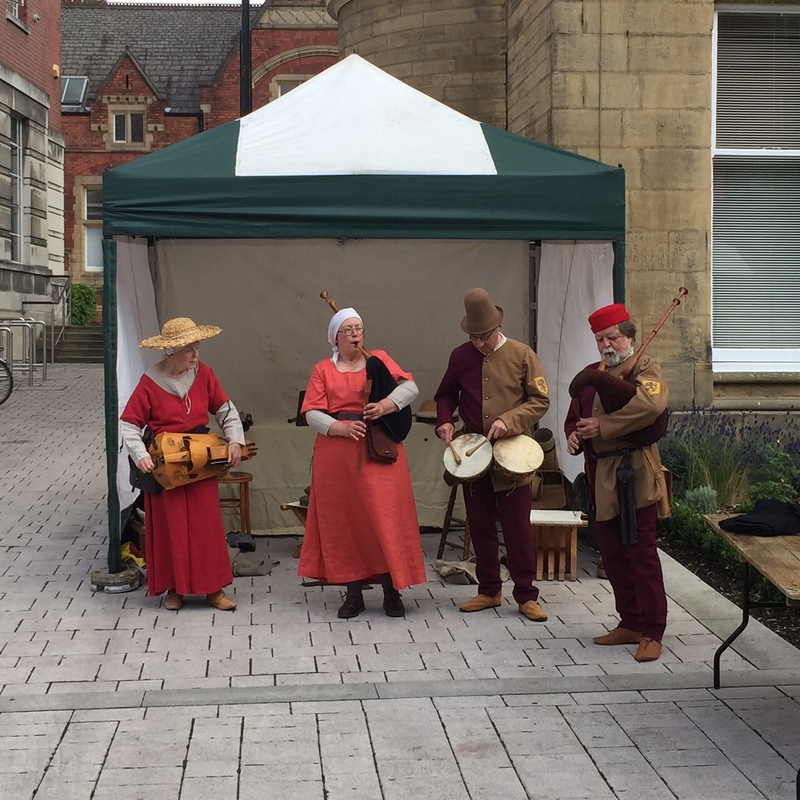 This benefits neither the specialist field within medieval studies, nor does it offer anything for wider audiences receptive to new information to become engaged by. 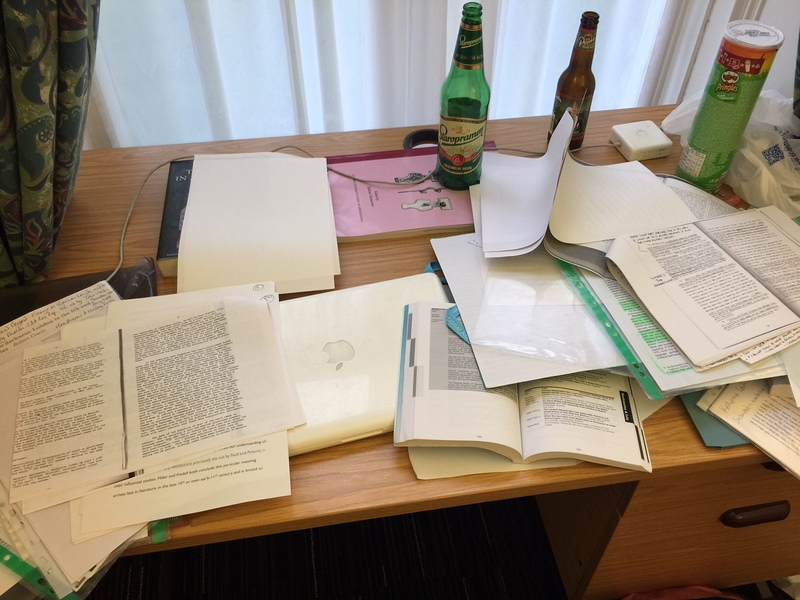 Even so, there’s an obvious argument that most medievalists are quite busy enough with their own research and other responsibilities without having to take up each and every idea for a possible new direction. One hopes that balances can be struck and the best possibilities are recognised and seized upon. The last full day of the IMC is all about nursing sore post-dance heads and marvelling at the birds of prey. 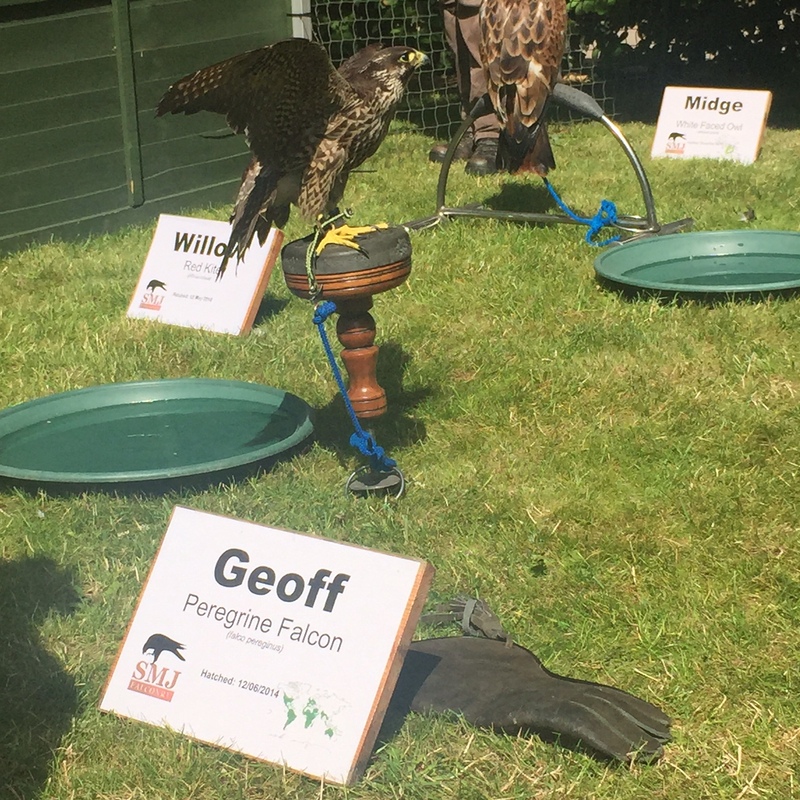 Geoff the peregrine falcon rocked my world. I made good my escape from Leeds on Friday morning, taking advantage of its wonderful Yorkshire location to take the train up to Wensleydale for a day of walking, swimming, and being chased by sheep. 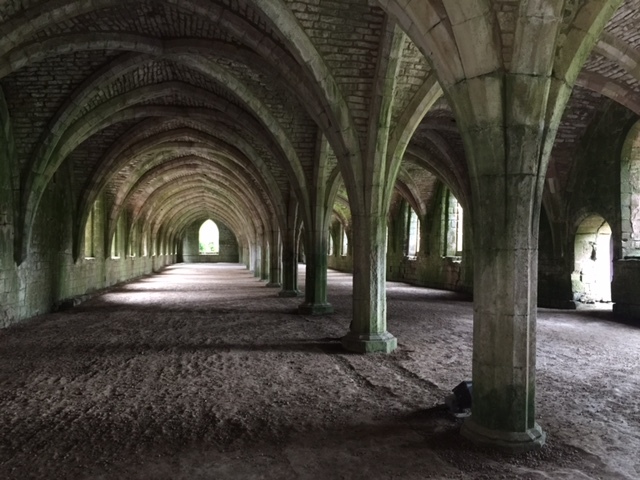 The day after, I left the Dales and visited Ripon cathedral (St Wilfrid’s crypt being my number one goal and clear highlight) and the quite astonishing remains of twelfth-century and later Fountains Abbey – in a different league to the Cistercian remains of Waverley Abbey I was raised on! The less said about my return to London through the loud, drunken streets of post-horse races York the better, other than to note I did walk past one of the Bishophill churches which was in a very pleasant and mercifully quiet corner of the city. 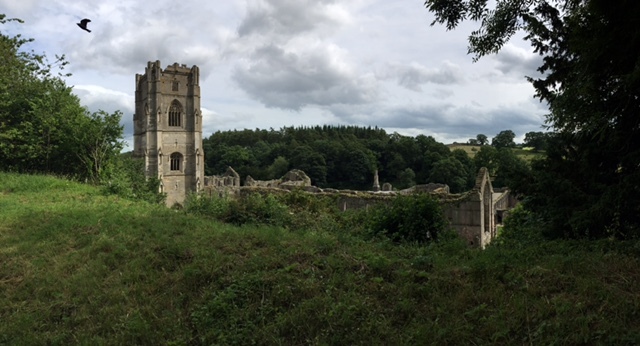 I’ll leave you with photos of a rutted track and some of medieval Yorkshire’s finest ecclesiastical architecture. 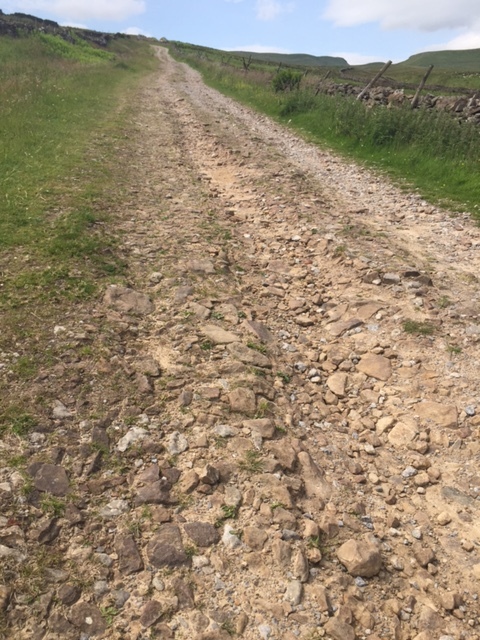 Cam High Road, a Roman road running down into Wensleydale. Not sure if the present stony surface is what’s left of Roman-era metalling, guess it could be? 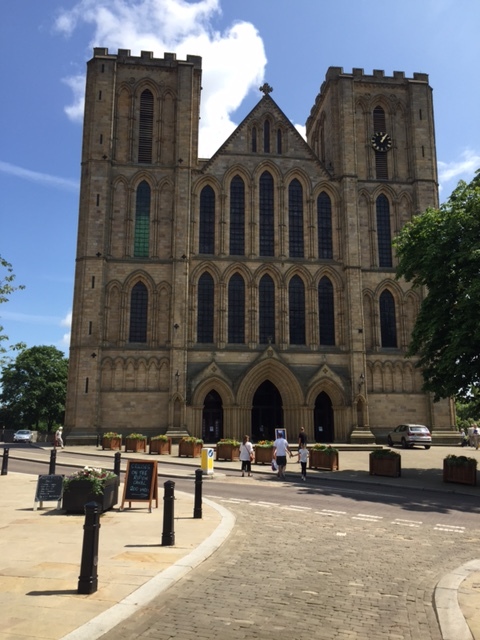 The west front of Ripon cathedral. Because there is no such thing as too many lancet windows. Being able to go down into the crypt beneath the crossing, very probably designed and built under the direction of St Wilfrid, was the main reason for my visit to Ripon cathedral. It was well worth the effort – I’ve tweeted a couple more pictures of the interior here. 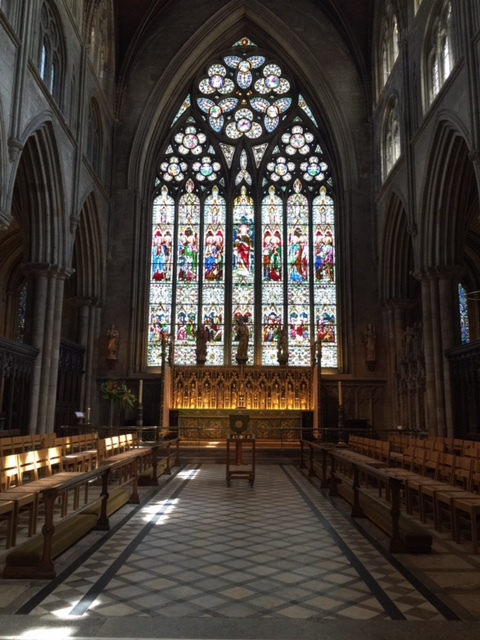 The stunning east window of the choir of Ripon cathedral, a masterpiece of Geometric Gothic according to the guide on duty, and who am I to disagree? 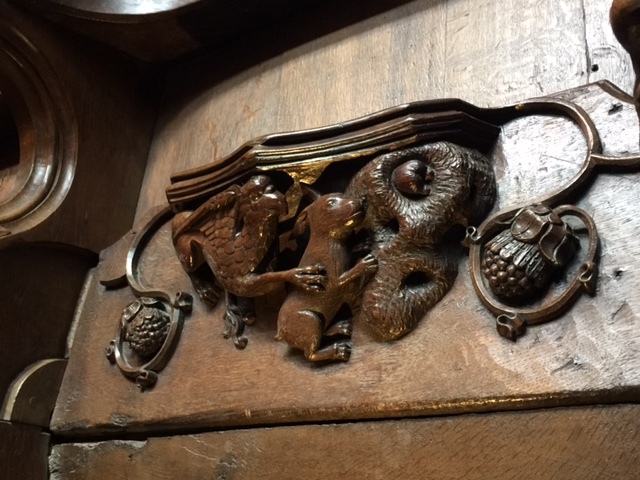 This misericord (which I want to say is 15th century) depicts a griffin chasing a rabbit, or maybe a hare. The point is it’s been claimed as the inspiration for ALICE IN WONDERLAND! I really want this to be true. 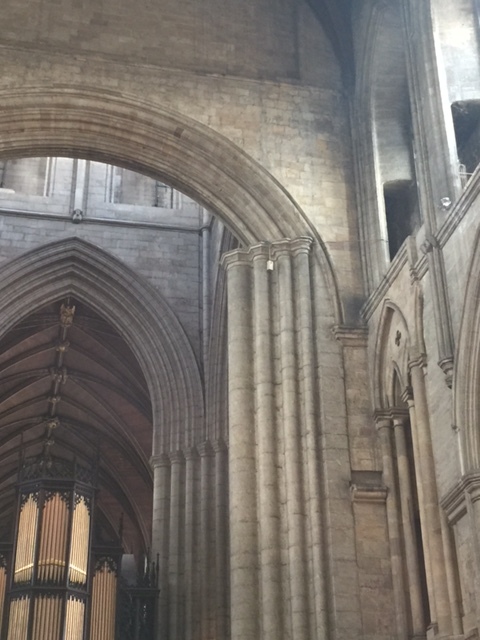 One thing I saw in Ripon cathedral that I’ve seen nowhere else is this very obviously incomplete late medieval replacement of the original 12th-century arch between crossing and nave. Methinks this improvement will never be completed. Remains of an aisle vault on the south side of the Abbey church. 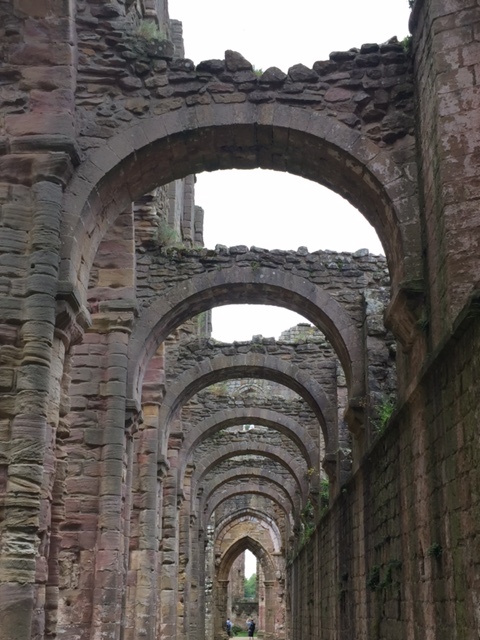 The very definition of Romanesque, I felt like I was back among the ruins on the Palatine Hill in Rome. 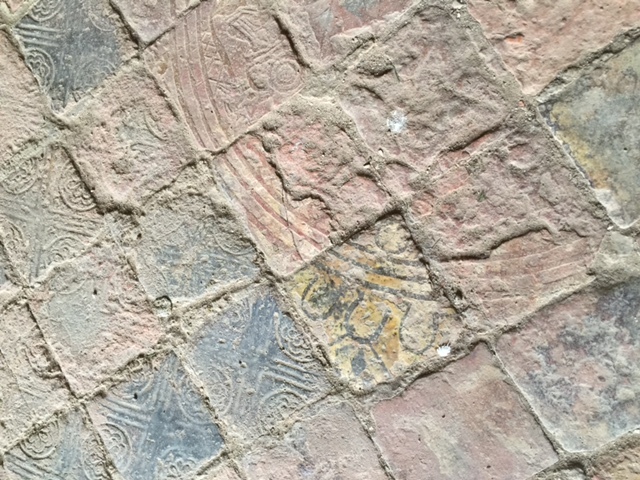 Delighted to find in situ glazed floor tiles amidst the ruins, albeit in the Muniment Room which has kept its vaulted roof to act as protection. A real classic Fountains image to finish with, the interior of the west range. 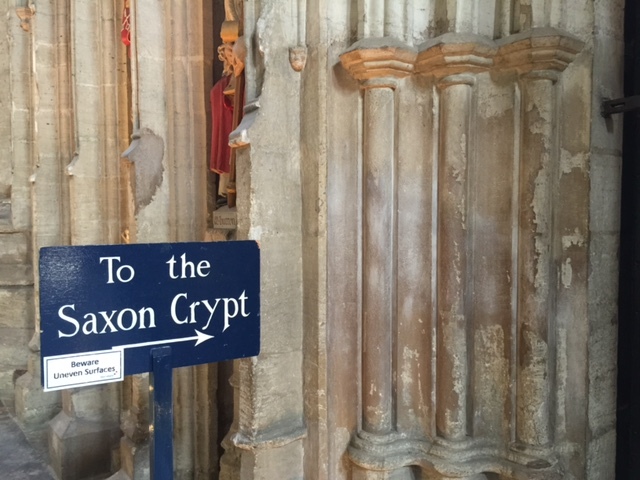 I’m presuming a 13th-century, to judge by its simplicity. 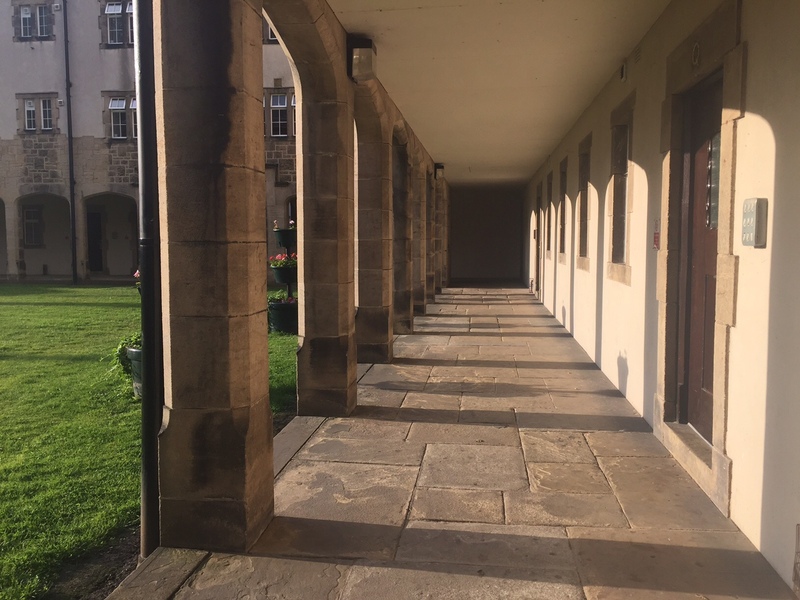 This entry was posted in Anglo-Saxon, Archaeology, Conference, History, Landscape, Leeds, Place-Names, Slavery, Wessex and tagged Archaeology, History, Interntional Medieval Congress 2015, Leeds, Leeds IMC 2015, Literature, medieval, Slavery, WPLongform, Yorkshire. Bookmark the permalink.